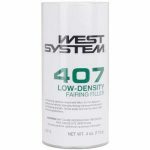 West System 407 Low-Density Fairing Filler - Goosebay Sawmill and Lumber, Inc.
407 Low-Density filler is a blended micro-balloon-based filler added to epoxy resin/hardener to make fairing putties that are easy to sand or carve. This epoxy filler is reasonably strong on a strength-to-weight basis. Cures with epoxy to a dark red/brown color.